CM Magazine: Which is Round? 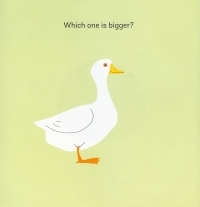 Which is Bigger? 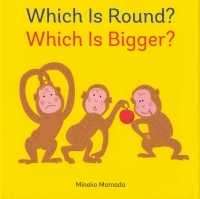 Which is Round? Which is Bigger? is a translation from the original Japanese book entitled Docchikana? which was published in 2010. 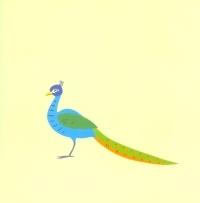 The original text and illustrations were provided by Tokyo-based author, illustrator and graphic designer Mineko Mamada. The simple text and illustrations are well-suited to the concept book format. The concept here presented is of comparisons between objects. The reader is asked to compare pairs of objects and then choose which one has a particular attribute. For instance, which object is round? Which is bigger? Which is longer? Initially, the answer seems to be obvious. This, however, is a concept book with an interesting twist. When the page is turned, the answer is revealed to be not what one originally supposed. For instance, on the opening page, an apple is compared with an armadillo, and the reader is asked which object is round. Upon turning the page, the apple has been eaten down to the core and is now an elongated, rather oblong shape, while the armadillo has curled up into a neat, round ball. The simple text and repetitive pattern are well-suited to beginning readers. The large text is also generally set against a white background, making the letters easy to distinguish and the text easier to read. The brightly coloured illustrations are simple in concept and design and complement the text nicely. Mineko Mamada's clever illustrative twists add interest to the book and to the concept of comparisons. Pre-school children will enjoy having the book read to them, and beginning readers will find it a useful resource with which to practice their emerging literacy.